Update: Build 14959 is now available for Mobile and PC fast ring insiders. Unified Update Platform: This build for Mobile is being published using our new update publishing system called Unified Update Platform (UUP). Controlling the Display Scaling of your Virtual Machines (PC): We’ve heard your feedback that Hyper-V Virtual Machines sometimes aren’t scaled as you’d expect, so we’ve added a new Zoom option in the View menu, where you can override the default scaling and set it to 100, 125, 150 or 200 – whichever matches your preference. Along the way, we also fixed an issue where certain VMs wouldn’t display the remote desktop connection bar after entering full screen mode. We are still refining the experience so there might be some rough edges. For example, although we added zoom levels to handle high DPI more gracefully, when zooming you won’t be able to see the VM’s whole screen without scrolling. fixed an issue for Insiders resulting in the automatic brightness setting unexpectedly being turned off after upgrading. Insider team re-enabled automatic brightness adjust for users that have never changed their auto-brightness setting. If you have already manually configured your auto-brightness setting, then this fix will not affect you. If you would like to enable or disable automatic brightness adjustment, please go to Settings > System > Display, where you can adjust your preferences. fixed an issue Insiders on domain connected PCs may have experienced where login might fail when the computer was disconnected from its domain network. fixed an issue resulting in certain apps, such as Outlook Mail and Calendar, failing to update for some Insiders with the error code 0x800700B7. fixed an issue for Insiders with certain device models where ejecting an SD card might result in a system crash. fixed an issue where disliking one of the Spotlight lock screen images would show the new image immediately, followed by a transition animation from the previous image to the new image. fixed an issue where launching an app from another app while in Tablet mode no longer launched it side by side, and instead launched it fullscreen (for example, when launching a web link from the MSN News app). If you have a 3rd party antivirus product installed on your PC, your PC might not be able to complete the update to this build and roll-back to the previous build. Internet Explorer may crash a few seconds after launch and working. Original Story:Microsoft officially announced that next Redstone 2 update will be called ‘Creators Update’. Windows 10 Creators Update will be next major update about Anniversary Update. The Creators Update will be available in March-April 2017. Check out what’s new is coming with Windows 10 Creators Update here. Meanwhile, Windows insider team is testing Windows 10 Redstone 2 PC build 14959 and mobile build 10.0.14959.1000. 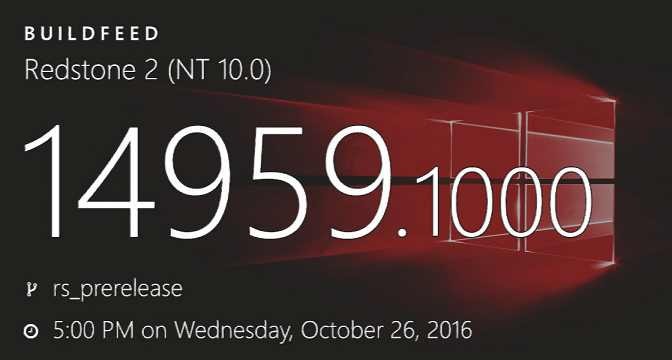 The internal build 14959.1000 was compiled on October 26, 2016. The cumulative update build 14393.443(Redstone), build 10586.639(Threshold 2), and build 10240.17157 (Threshold) are also under testing. Windows 10 1607 cumulative update kb3197954 build 14393.351 is available for release preview members. Windows 10 preview build 14931 is also now available for Slow ring insiders. You can download ISO from here. Recently, Microsoft also rolled out build 14951 to fast ring insider members. Whereas, mobile users are facing download and installation issues. Now the company suggested few workaround for users facing problems. Link below.